THE OCHRE DUST of East Africa filled the Land Rover and covered its four occupants, black and white alike, with the same red hue. Only tiny rivulets of their sweat revealed the true colors of their skins. Gates's professional hunter, J B Blacklaws, tried to wipe the red dust away with a handkerchief, but he just smeared it into his perspiration, and it gave him a hideous countenance. Blacklaws cursed and rapped-out a terse command in Swahili: "Toa beer-i ene" - (Take out four beers). Wangi and Nzomo had been sitting in the back like sphinxes, ignoring the dust. At Blacklaws's command for beer, they grinned, showing white teeth. They passed two warm, foaming bottles of Tusker beer to Gates and Blacklaws, and two more bottle caps popped as they opened their own. "My bloody oath!" Blacklaws exclaimed as we stopped for at least the tenth time to let native herdsmen move their long-horned Ankole cattle out of the road. "If we don't get to Kampala by four o'clock to pick up the licenses and permits, we will lose another day." Gates and Blacklaws were beginning another of the private exploratory safaris that they both liked so well. No lorry piled high with equipment impeded their progress. They had no excessive crew of native helpers. They had just the Land Rover, with Blacklaws driving and Gates in the passenger seat, with Wangi and Nzomo in the second seat with the guns and other essential gear. In the back compartment, they had two drums of petrol, the small tents, and the outboard motor that they would need on this trip. They carried a minimum of tinned food - intending, as usual, to live on game and whatever else they could scrounge off the country or buy in small villages here and there. Their deal was that Gates paid all the expenses, and whenever they found a new game area or a hidden pocket where his hunters could collect good trophies, Blacklaws could later take other clients there. Before this trip, he had gotten information from an old chum whom he had known in the service during World War Two. His chum had recently been assistant to a district commissioner in northern Uganda. On a visit to Nairobi while on his way home to England, he had told Blacklaws about an area on the east bank of the Nile, in uninhabited country north of Lake Albert, where the elephants carried big ivory. Satisfied that his chum's information was worth one of our exploratory safaris, Blacklaws had cabled Gates. Gates had arrived at the Nairobi aerodrome twenty-two hours later. Soon, they were on the tarmac road heading west toward Uganda. About thirty miles out of Nairobi, they came to the edge of the escarpment. Blacklaws pulled over and stopped the Land Rover. While he supervised the tightening of the ropes holding the petrol drums, Gates climbed out to take a good look at one of his favorite views. "MMBA," Blacklaws called it - miles and miles of bloody Africa. Spread out below and stretching as far as the eye could see was the great Rift Valley, a sea of yellow grass gently undulating in the breeze, dotted here and there with the distinctive flat-topped acacia trees. Off to the right stood the old volcano Longonot, against blue-green mountains. Behind, thrusting out of the dark forests and vividly etched by the late sun, were the Ngong hills. Down in the valley, they turned right, to the east of Longonot and on by Lake Naivasha, and climbed back into the high country. They reached Blacklaws' farm at Elmenteita just at dusk. "It's about three hundred miles to Kampala," he said at dinner. "With an early start, we ought to get there at four." They got there in fair time, in spite of the dust and the inevitable delays while herdsmen moved their long-horned Ankole cattle, peculiar to Uganda, off the road. Finally, with all the official formalities completed, Blacklaws pulled the Land Rover up in front of the Imperial Hotel. They registered, then went into the bar and ordered a pitcher of cold beer. "This cuts the dust better than anything else," Blacklaws said, taking a long pull. "And this is our last chance for a shower and a good bed." "What do you think of our chances for good ivory?" Gates asked. "If half of what my chum told me holds true, we ought to locate something well over a hundred pounds. He reckons nobody has been hunting in that part of the country for a good twenty years." From the moment when Gates had received Blacklaws's cable, his pulse had quickened at the thought of going after big ivory, and the same feeling came to him back again as they discussed the coming hunt over the cold beer. Gates swore that if the time ever came when he didn't feel that quick surge of excitement over this kind of safari, he would hang up his rifles. Anticipating these exploratory safaris, he had left one of his rifles with Blacklaws. They had picked it up - a .300 Weatherby Magnum - during the stopover at his farm. For ammunition, Gates had left a selection that would suffice for any kind of game that they went after - a couple of boxes each of 180-grain Hornady soft-points, 180-grain Noslers, and 200-grain Noslers. Certain experts as well as other well known hunters consider the .300 too light for hunting elephant. But Gates had taken elephant with this cartridge before. He had no hesitation about using it if he were to get a clear open shot or if he would have to shoot farther than a hundred yards. Usually, elephant-hunting is close-up business - the closer the better. Under normal circumstances and with careful stalking, it is possible to get within twenty-five yards - sometimes much closer. Elephant-hunting can entail close-quarter shooting in heavy brush. For that, Gates preferred to use one of Blacklaws' matched set of .470 Westley Richards double rifles, using 500-grain Kynoch full-patch bullets. Gates was not enthusiastic about using solids for hunting big game, a reluctance that he'd not kept secret, but Blacklaws was. This was one of their few differences. He was born and bred with them and wouldn't carry soft-point cartridges for his .470s. Long before, they had argued to stalemate on the subject, with mutual respect and acceptance of each other's opinion. He knew that at a hundred yards plus, with a bit of time to get on-target, Gates could place an accurate shot with his scope-sighted Weatherby that would bag the game. But at close-range snap-shooting, he was a master at handling his superbly balanced .470 doubles. Gates did not hesitate to bow to his superiority. During many close confrontations over the years, it always comforted Gates to know that Blacklaws was at his side with his .470 double - solids and all. Especially in close-range elephant-shooting, the important thing is to place the bullet well, whether it is a solid or a controlled-expansion bullet like the Nosler. The next day, they drove the hundred and fifty miles northwest to Masindi, then due north another forty miles. They crossed the Nile at spectacular Murchison Falls, which Sir Samuel Baker discovered and named in 1863. They crossed the Nile again on the Pakwach ferry about ten miles north of its outlet from Lake Albert, also discovered and named by Baker, then turned right along the west bank. The narrow road soon came to an end at a small village. On a little rise that overlooked the murky waters of the Nile, they set up a meager base camp. After inquiry, Blacklaws soon found the decrepit old boat that his chum had told him about. It needed patching. Their two men, with the help of several villagers, attended to it while Gates and Blacklaws sat under a tree drinking warm beer and Blacklaws pried what information he could get out of the local chief. "About ten miles north of here, the Aswa River comes in from the east," Blacklaws said. "That's where we will set up our fly camp." At dawn, they pushed off downriver, taking with them two of the locals who had been on the other side of the river and whom Gates and Blacklaws would need to help maneuver the boat while they drifted. Floating clumps of papyrus, called sudd islands, drifted along with them like ancient galleons. The early sky changed from gray to pink. Hippos snorted and churned the water. Once, one came up beside the boat, then disappeared in a swirl. Heavy crocs slid off the bank as the hunters approached. And there were elephants, feeding along the bank and out into the sudd. Blacklaws scanned the banks and the country inland with his binoculars, while Gates glassed ahead. They stopped counting after two hours of drifting and forty elephants. No big ivory yet, but both men were excited. The best tusks were about seventy pounds to the side. With this many elephants to look over, they figured that it was a matter of time before they saw a big one. Blacklaws had that certain twinkle that the sight of elephants always put in his eyes. Each bend and twist in the river brought more into view. Elephant fever caught up even the normally stoic Wangi and Nzomo, who constantly pointed, jabbered in their native Dorobo dialect, and switched to Swahili now and then for Gates's benefit. "Tembo, mingi sana," Wangi said with a toothy smile when they had about fifteen in sight at one time. Blacklaws, probably as good a judge of ivory on the hoof as any other professional hunter in Africa, called-out his estimates as they drifted along. "Those two bulls - the one on the left, about sixty, sixty-five, the other a shade over fifty." Late in the afternoon, they reached the Aswa River and set up their fly camp. While Blacklaws, Wangi, and the two locals were putting the camp in order, Gates walked upriver with Nzomo and bagged a Uganda kob for the larder. This small reddish antelope with lyre-shaped horns stands about thirty inches high at the shoulder and weighs about a hundred fifty pounds. Later, as the smell of roasting fillets pervaded the air, the hunters sat on the small folding canvas camp chairs, drinking warm beer and watching the ever-changing scene of the Nile. The late sun put a red sheen on the water and highlighted the floating papyrus islands. Birds and waterfowl swept by, black silhouettes against the deepening sky. "Let's hunt down the river for a few days," Blacklaws said. "Most of the elephants we've seen are along the bank, and we can cover a lot of country just by drifting in the boat. Then we can use the motor to come back against the current." The hunters were seldom out of sight of elephants that fed along the banks or out in the sudd. The country inland appeared to be a bit dry, with the grass already yellow, although most of the trees still had their leaves. "So far, the information from my chum has been pretty accurate," Blacklaws said one day. "With the back country dry this time of the year, the elephants have migrated down from the hills and have concentrated along the Nile." "Only we haven't seen any of those hundred-pounders yet," Gates said in jest. They both knew that they wouldn't find that kind of ivory in bunches like bananas anywhere in Africa. They were few and far between, which is what makes a hundred-pounder one of the most desirable big-game trophies in the world. Late one afternoon, as they were chugging upriver on their way back to camp, Wangi, who was perched on the framework over the center of the boat, motioned frantically. Gates quickly shut off the motor, and they put their binoculars on the elephant that he was pointing to - a lone bull standing motionless under a tree about five hundred yards from the river. One quick look confirmed that he was carrying better ivory than any that the hunters had seen so far. Gates guessed that his tusks would go a hundred or better. Blacklaws guessed eighty-five to ninety. Without hesitating, they took a closer look. As Blacklaws directed the men to pole the boat silently toward the shore, Gates and Blacklaws discussed the situation in subdued tones. Gates wanted some real trophy-sized ivory, well over a hundred pounds if at all possible, and quickly decided to let Blacklaws take this one if he wanted it. This was part of their understanding on elephant safaris. Gates got first choice of ivory, and if he picked first, Blacklaws got the next elephant even if it carried better ivory. If Gates turned one down, as he did with this one, Blacklaws could take it. He took it. They made an easy stalk, coming upwind slowly and cautiously, careful to make no noise. Elephants have poor eyesight, but their senses of hearing and smell are acute. From twenty-five yards, Blacklaws belted the bull between the ear and the eye for a classic side brain shot with a five-hundred-grain solid from his .470 for an instant kill. Later, when they checked in, the tusks weighed 92 and 94-1/2 pounds. For four more days, they hunted along the Nile with the boat, then beached it at their fly camp on the Aswa River. They had about two gallons of gas left, little more than enough to get back up the river to their base camp. They sent the locals off on scouting trips and hunted along the Aswa River and in the surrounding country on foot, covering six to ten miles a day. They saw more elephants, a couple with ivory that tantalized Gates, but nothing that they figured would go over a hundred pounds. Footsore and weary, they had about decided to take the boat back to base camp for more fuel when one of the locals came in with news of big elephant tracks. He had followed them for half a day before he turned back to report. Big tracks don't guarantee big ivory, but the urge to follow them up for a look is nearly irresistible. "Tell you what," Gates suggested, "We have to go back for more gas, so let's run down the river and take a quick look." Gates pulled the boat in about a mile above the small valley where the local had found the big tracks. The wind was coming from the west, so they cut inland and intersected the trail. The tracks really were big, nearly two feet in diameter. Where the ground was soft, they were deep. The trail angled north toward the Nile. Two hours and several miles farther, the tracks entered a high stand of papyrus in a swampy bend of the river. Both Wangi and Nzomo had been carefully checking the tracks and the occasional mounds of dung. The signs were fresh. "He probably is in there somewhere," Blacklaws whispered. "I'll send Wangi to the lower end just to make sure he hasn't come out." Ten minutes later, Wangi came back at a dead run, motioning downriver. "Pembe m'kubwa," he gasped - (big tusks). The hunters took off at a fast jog. Wangi unleashed a torrent of whispers. The elephant was in the water at the edge of the river, slowly moving downstream. Wangi had caught a glimpse of him crossing an opening in the screen of papyrus. They stopped once to get air into their straining lungs and to double-check the air movement. It was still right, coming-in from the river. Shortly, they reached a little point of land at the edge of the river, just below the papyrus swamp. The bull would have to come by there if he kept moving downriver. Then they heard water sloshing. Blacklaws pointed silently to where the tall papyrus was moving. The hunters crouched behind a clump of small bushes as the bull came ponderously on. It couldn't have taken another five minutes for the elephant to cover the remaining distance, but as always it seemed like an eternity. Once, Gates gently eased the bolt of his .300 open to make sure there was a cartridge in the chamber, then made sure that the variable scope was turned down to 2x, its lowest magnification. Suddenly, he wished that he had Blacklaws' other .470 double. This was going to be a close shot. Just then, the bull came out into the open, belly-deep in the water, not forty yards from Gates. His huge stained tusks took Gates's breath away. They looked as big as telephone poles as he held them up out of the water. Oblivious to everything but the huge bull, Gates stood up, raised his rifle for what should have been an easy side shot, and fired. The bullet hit him, but he didn't go down. Somehow, Gates had not placed the bullet in the right spot to hit the brain. He had either flinched or had a sudden flash of buck fever, something that hadn't bothered him for thirty years. The big elephant swung around toward the river, away from Gates, and took two or three steps out into deeper water before Gates could work the bolt, bring the rifle to bear again, and place the second bullet behind his ear for an angle brain shot. This time, he was lucky. The bull sank slowly in the water as his legs buckled - and to Gates's horror, he went down out of sight, completely submerged. Blacklaws grasped the implications of this a second or two before Gates did. "My God!" he exclaimed, white-faced. "If he gets into the current, we've lost him!" Gates's instant elation at downing the huge bull turned as quickly to despair at the thought. "Quick!" Blacklaws said, still thinking ahead of Gates. "You run for the boat and bring it here. We've got that one coil of heavy rope. I'll have the boys braid a bark rope, and I'll dive down and try to fasten it to him before the crocs come in." Gates said that as long as he lived, he'd never forget the agony of that lung-searing marathon. It would be an outrageous cliche to say that he died a hundred times during that excruciating jog back to the boat, but it is true. His one quick look at those huge tusks was enough for him to know that this elephant carried the biggest ivory that he'd ever seen. Gates guessed their weight at a hundred fifty pounds or more, with his thoughts of their size constantly being replaced by visions of swarming crocodiles pulling the huge carcass off into the deep current of the river. If that happened, the hunters would never recover the tusks. What a tremendous relief it was, just at dusk, to pull the boat in and to see Blacklaws's thumbs-up gesture. But the hunters weren't home yet by a long shot. He had managed to get the heavy bark ropes around two of the legs that were only a few feet under the surface of the murky water. The weight of the massive tusks had turned the carcass upside-down; they now rested on the river bottom in at least fifteen feet of water. "What we have to do now," Blacklaws said, "is to go back to base camp and get that roll of three-eighths steel cable that I carry in the Land Rover. We can make some slip loops, and by using the boat and long poles, I think we can get the cable around the tusks. It's the only chance we have. Right now, let's get the rope on one of the legs." It was soon dark, but with the aid of a full moon and flashlights, they finally got the heavy rope on one of the elephant's legs at about the same time that one of the bark ropes parted. Gates and Blacklaws left one rifle and most of the ammunition with Nzomo, with instructions to fire a shot in the water every half hour for what little good it would do to discourage the crocs, and to build a big fire on the bank and have the two locals bring up a hollow log and pound on that - anything to try to keep the crocs away. At the base camp, Gates made slip loops in the steel cable while Blacklaws rounded up as many locals as the boat would carry. Gates never did get a head count, but there must have been fifteen. At that point, he and Blacklaws had thoughts of dragging the elephant out of the water with sheer manpower. They reached the scene just as dawn was breaking. The ammunition was all gone, and the second bark rope had parted, probably the work of crocs. Fortunately, the heavy manila rope still held. It would be tedious to describe the long, desperate, agonizing hours of trial and failure, as well as the constant distraction of the crocs, before they got the cables looped and tightened on both tusks. Only then, with aching arms and blistered hands, did they relax for the first time in thirty hours. Gratefully, they lit cigars and took alternate pulls at a bottle of peach brandy. Shortly, they had our first bit of hot food. "Let the crocs chew on him now," Blacklaws said. "Maybe then we can drag out what they leave, with all hands on the cables." They tried. It didn't work. The clamp popped off one cable, and they had to go through the whole agonizing business again to refasten it. "A few days out in the sun," Blacklaws remarked once, "and you can slip the tusks out of an elephant without chopping. But under water - I don't know. It might take longer. All we can do now is wait." "Until Christmas if necessary," Gates said grimly. "I'm not leaving here without those tusks." They rigged up a series of poles that kept a constant pull of several hundred pounds on the cables. Then Gates stayed while Blacklaws took men in the boat to strike their Aswa River fly camp, then set it up again where they watched over the sunken ivory. While they waited, they hashed over the event with the usual hindsight but finally agreed that Gates had made the right move by shooting at the instant when the opportunity presented itself. 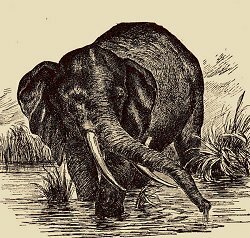 If he had waited, the elephant might have come out onto dry ground - or he might have detected us and churned back into the papyrus, or out into the river, or any other of several possibilities. If they raised the tusks, their long discussions would be academic. On the fifth day, they heard a shout from one of the men watching the cables. One cable was slack. Carefully, they hauled it in. All hands screamed with exhilaration when that beautiful great stained tusk slid up onto the bank. They put more pull on the other cable, and four hours later, they slid the second big tusk out onto the bank of the Nile. It was almost a perfect match for the first one. Both were long and extremely massive, carrying their weight well out toward the tips. "I'm afraid to guess the weight," Blacklaws said, shaking his head, "but that's the heaviest ivory I've ever laid eyes on." Later, at a small village on the way back, they weighed in at 179 and 184 pounds. Even after the herculean task of raising the tusks from the waters of the Nile, Gates still didn't have them home yet. Even more problems lay ahead, including theft, political intrigue, and almost confiscation. In Kampala, a pompous commissioner was closing out his career. He decided that he would take them back to England as souvenirs of his term in Africa. He tried every trick in the book - legal, illegal, and political, to the point of confiscation - to get control of the ivory. Gates and Blacklaws were forced to bury them before leaving Uganda, and it was nearly a year before Blacklaws could get back and take them out in his lorry, first to the Congo and then into French Equatorial Africa, to arrange for shipment to Gates. After being stolen from the shipping agent, taken into Ruanda, then recovered with rewards and bribes, and smuggled back into French territory, another year went by before Gates finally got them. When they arrived in America, Gates had them officially weighed and measured. Each tusk was eight feet, eleven inches long on the outside curve. Their circumferences were 24 and 24-1/2 inches, their weights 176 and 181-1/2 pounds. Big ivory! And this hunt had taught Gates that if you shoot an elephant in the waters of the Nile, don't count on the ivory until you get it home. Copyright ?2006 Dr Kenneth E Howell. All rights reserved.